Metaphor Magic draws from symbolic modeling, systems theory, sandplay therapy, and Clean Language, and uses symbolic metaphors to support clients in coaching and coaching supervision. The Metaphor Magic Box contains small objects with which clients build and explore their metaphoric landscape in relation to a question, topic, or scenario. The coach or coaching supervisor facilitates a discovery-based process using direct, succinct, open-ended questions to support clients in unpacking and examining the content and context of their landscape. The underlying neuroscience and somatics of Metaphor Magic are offered, along with applications to different audiences and examples of transformational experiences of participants. Seto, L. and Geithner, T. (2018) ‘Metaphor Magic in Coaching and Coaching Supervision’, International Journal of Evidence Based Coaching and Mentoring, 16 (2), pp. 99-111. DOI: 10.24384/000562 (Accessed: 10 October 2018). Metaphor is defined as “a figure of speech in which a word or phrase literally denoting one kind of object or idea is used in place of another to suggest a likeness or analogy between them” (Merriam-Webster, 2017). Metaphor is also defined as “a type of figurative language that alters the literal meanings of words or phrases” (Bowes and Katz, 2015, p. 1). Research indicates that the use of metaphor is common in conversation (Cameron, 2008; Glucksberg, 1989), and that metaphor provides a concise way of communicating complex information in a way that enhances, illuminates, clarifies, and/or explains concepts not easily understood with literal language (Ortony, 1975). Metaphors actively demonstrate our central ways of thinking, meaning-making, and taking action in the world (Tompkins and Lawley, 2006). They reflect our views of the world and offer a vehicle for the coach or coaching supervisor to understand clients, as well as a way in to self-understanding for clients. The purpose of this article is to capture the essence of Metaphor Magic, which utilizes symbolic visual metaphors in coaching and coaching supervision. The theoretical underpinnings of Metaphor Magic are presented, along with an emerging model which combines the tool (the Metaphor Magic Box), the clients’ content, the process, and the magical intersection of these three, all working within the background of its energy field. In addition, an introduction to the neuroscience behind what makes exploring symbolic metaphors so powerful is offered, and some examples of the applications of Metaphor Magic are provided. Metaphor Magic has multiple theoretical foundations, including symbolic modeling, systems theory, sandplay therapy, and Clean Language (Grove and Panzer, 1989; Lawley and Tompkins, 2004). Symbolic modelling (Tompkins and Lawley, 1997, page 1) is “a process for identifying how people represent their experience through metaphor and symbol”, and its primary purpose is to facilitate a client’s learning about themselves and their patterns through exploring their metaphors (Lawley and Tompkins, 2001). Metaphor Magic involves metaphoric modelling, a type of symbolic modeling that uses visual metaphors. The process invites the client to explore a question or topic of interest by constructing a metaphoric landscape with objects. This landscape of objects and the relationships among them provide the context for increasing clients’ self-awareness and awareness of their existing systems. Clients have the opportunity to create new metaphors and landscapes for what they want moving forward, and to shift their stories (Brené Brown’s work on the stories we tell ourselves – Brown, 2015). For clients, the process of creating and subsequently remodeling their metaphoric landscapes can facilitate problem-solving and/or be generative, such as developing new ways of being or taking action in the world (Tompkins and Lawley, 1997). Systems theory is another foundational element of Metaphor Magic. It is a multidisciplinary field which studies “the abstract organization of phenomena, independent of their substance, type, or spatial or temporal scale of existence. It investigates both the principles common to all complex entities, and the…models which can be used to describe them” (Heylighen and Joslyn, 1992). It describes a system as comprised of four things: objects (the parts, elements, or variables within a system), attributes (properties or qualities of the variables in the system), internal relationships among the objects, and an environment in which the system exists (Bertalanffy, 1969). In Metaphor Magic, clients’ systems are illustrated by the objects they choose, and the meaning they make of the objects and how the objects are placed on the mat in relation to each other within an environment (physical, social, cultural, etc.) and energetic field. Sandplay therapy is defined as “hands on psychological work” which serves as an adjunct to talk therapy (Friedman and Mitchell, 2017). In sandplay therapy, clients use sand, water, and miniature objects (i.e., the elements of the client’s system) to create concrete manifestations of their internal symbolic world (Friedman and Mitchell, 2017) and actively engage with the symbols of transformation (Dunn-Fierstein, 2017). The process allows for the emergence of the clients’ personal and archetypal symbols in a safe environment (the sandbox or tray) and supports clients in moving towards a sense of balance and wholeness (Friedman and Mitchell, 2017). Finally, Clean Language is a therapeutic approach developed by David Grove (Grove and Panzer, 1989) in which the therapist uses a relatively limited set of concise, open-ended questions to facilitate “the client’s process, ensuring that the client’s meaning and resonance remain wholly intact, uncontaminated by the therapist’s words. It opens the door to change” (Grove and Panzer,1989, p. 1). Similarly, in Metaphor Magic, the questions posed by the coach or coaching supervisor are intentionally concise and open-ended, and powerful in that they help facilitate the client’s process and meaning-making and reduce bias in the process by avoiding interjecting the coach or coaching supervisor’s interpretations. The first author learned about using small objects in a “sandbox” method (“sandplay therapy”: C. G. Jung Institute of Los Angeles, 2017; Dunn-Fierstein, 2017; Friedman and Mitchell, 2017) while completing her Coaching Supervision Diploma. Taken by the power of the symbolic metaphors used during the demonstration, she gathered a collection of approximately 21 small objects (such as toys) and began experimenting with using the box with coaching clients. 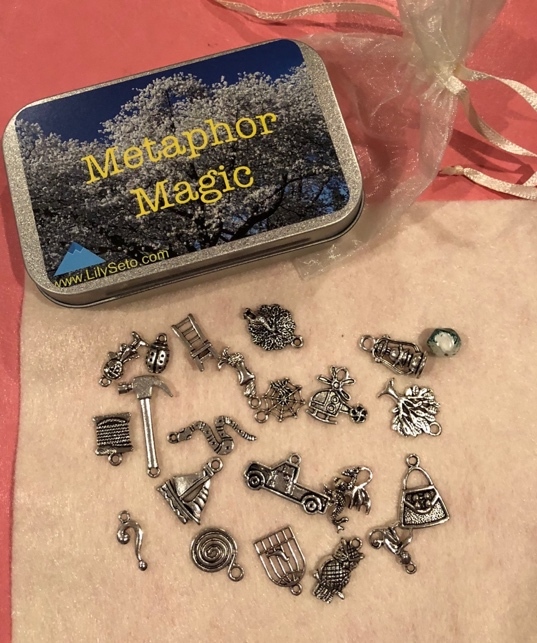 Over time, the box of objects (being bulky) was switched to a small tin box containing charm objects for greater portability, and the process became known as Metaphor Magic, and the tool, as the Metaphor Magic Box (Figure 1). The objects in the box represent the parts, elements, or variables within clients’ systems. The objects serve as visual metaphors or metaphoric representations of questions, topics, or scenarios on or around which clients wished to be coached or supervised, and the medium with which they model their metaphoric landscapes. A small felt mat is included in the box, on and off which clients place the objects they select and/or rearrange them in ways that represent their systems. The mat represents the context in which the client’s system exists and serves as a working space in which to add to or rearrange the model elements in the system. The client chooses which objects to bring onto the mat and which are left off the mat. More specifically, the initial phase of contracting for the Metaphor Magic Box session creates a safe space by establishing confidentiality and offering clients an invitation to further discuss anything that comes up after the session (coach’s ethical responsibility). Clients are provided with a general framework for how the session will proceed, i.e., that questions or prompts will be offered to guide the process of exploring and discovering more about their question/topic/scenario, and that clients will have an opportunity to journal or discuss their choices and meaning-making during and after the process. Because it is timely here, we’ll briefly discuss the content of Metaphor Magic and then expand the description of the process. As is true in coaching conversations, the content of Metaphor Magic is comprised of the question, topic, or scenario that clients wish to explore, and the objects they choose to represent them and aspects or elements of their systems. Clients choose as few or as many objects as they see fit, and the content belongs to them, as do the attributes that they assign to the objects. The content often represents a complex or ambiguous problem or scenario: complex in that it has many moving pieces and layers, yet there may be a clear goal or solution being sought; or ambiguous in that the challenge or scenario is constantly shifting, moving or evolving; and the goal or solution is not clear (Seale, 2016a). Clients then introduce their question (or topic or scenario – using whatever language clients choose) into the space. Clients are then invited to breathe the question into their bodies (inviting somatic awareness, centering, groundedness), to choose objects to represent aspects of themselves (to attend to their perceptions and to self-model, as per Lawley and Tompkins, 2004) and the other elements of their question/topic/scenario, and to place them on their mats, the whole of which represents the clients’ “systems” (elements, attributes, relationships among elements, and context/ environment). The process emphasizes a discovery approach: letting the client explore what the objects and relationships among them have to tell them. Carl Jung wrote: “Often the hands know how to solve a riddle with which the intellect has wrestled in vain” (Friedman and Mitchell, 2017). Once the symbolic landscape is completed, the coach guides their clients’ exploration and supports them in building and interpreting their metaphoric landscape. The coach invites curiosity, taking care to use concise, open-ended questions and prompts, such as the samples below, and to not name the items before clients do. Talk about the link between the item you chose and how it represents you in the question/topic/scenario. Talk about the objects you chose to represent others/other elements to the question/topic/scenario. If you view your metaphoric landscape from 10,000 feet above (i.e., standing up and looking down on it) or from the balcony (viewing it from below or from the side), what do you notice? Is there anything about how you have placed the items on the mat? What is the relationship among the objects? What do your head, heart, and gut have to tell you about your question/topic/scenario? If you had the ideal state or scenario, what would it look like? Feel free to build it. What’s the opportunity between the current and the ideal state? What steps do you need to take to create your ideal state? What did you learn about your question/topic/scenario? Other questions and prompts used in Metaphor Magic sessions have been drawn from Peter Hawkins’ 7-eyed coaching supervision model (Hawkins and Smith, 2013), Nancy Kline’s Time to Think (2013), and David Grove’s Clean Language (Lawley and Tompkins, 2000), as well as from the coach’s intuition. Some questions and prompts are intentionally included to invite the whole of the client’s intelligence online (e.g., breathe the question/topic/scenario into the body; what do your head, heart, and gut have to tell you?). To encourage the client to go deeper and to support more discovery and learning, the coach can pose the question “What else?” iteratively over the course of the process. Nancy Kline says: “Even when people are sure there is nothing left in their weary brain, there nearly always is. Surprisingly the simple question, ‘What else do you think about this?’ can usually lead them straight to more, often good, ideas. In the presence of the question, the mind thinks again” (Kline, 2013, p. 39). This AWE (And What Else?) question “…has magical properties. With seemingly no effort, it creates more – more wisdom, more insights, more self-awareness, more possibilities – out of thin air” (Stanier, 2016, p. 58). “When you use ‘And what else?’ you’ll get more options and often better options. Better options lead to better decisions. Better decisions lead to greater success” (Stanier, 2016, p. 59). The coach’s iterative use of “What else” helps clients become aware of thoughts that they had not accessed before and uncover underlying or additional meanings to the metaphors they have generated. This reflection or “iterative reprocessing” is frequently observed in Metaphor Magic and other coaching approaches and provides the basis for the development of attentional control and executive function (cognitive flexibility, working memory, inhibitory control) (Zelazo, 2015). When used in an individual coaching session, the questions and answers take the form of a conversation between the client and the coach. In a group or team coaching session, the questions or prompts can be offered in a facilitated conversation which explores a common metaphoric landscape, or the clients/supervisees can capture their reflections on and responses to the questions or prompts in writing or by journaling. The coach’s presence plays an important role in keeping the focus on the client’s work, in part by holding silence and liminal space while the client is processing, so as not to interrupt the process. Eye contact from the facilitator/coach is not necessarily desired, except when the client completes processing and returns for the next question. In addition, the coach can attend to how the client is showing up, somatically (e.g., voice volume, tone, inflection, pace; posture; facial expressions; quality of movement; energy; etc. ), and to what the client is doing with the objects (i.e., which objects are selected and in what order, in what ways and how frequently the client manipulates the objects, etc.) in order to reflect this information to the client for the purposes of inviting greater self-awareness and further discovery. Although we want to minimize bias in order for clients to be immersed in their own processes, it is worth noting that bias is introduced by the nature of the objects in the box as well as the questions that the coach chooses to guide clients through the exercise. The coach wants to consider what will best serve the client in the moment. Bias can be minimized through the use of very open-ended and relatively concise and direct questions, refraining from naming the objects chosen, and ensuring that the boxes are randomly packed and chosen by the client. The coach also has a responsibility to maintain a neutral yet curious demeanor or presence during the session, by not adding any encouragement, cheerleading, or judgement into the space. This requires self-awareness and self-regulation in order to keep the process as one that is owned and directed by the client as much as possible. 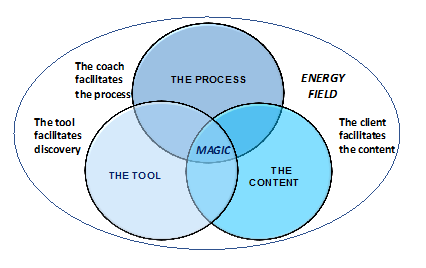 Figure 2 illustrates an emerging model of Metaphor Magic and its components and an energetic field within which facilitator/coach and client work and they co-create that serves as the background and container for the Metaphor Magic process. In it, we see that in the intersection of the Tool, the client’s Content, and the Process, lies the Magic, which Voldtofte (2005) asserts has the power to transform. He states that, “The magic in the middle begins with a shift in awareness, from parts to relations between parts” and that it may be found everywhere when we choose to pay attention to the relations among the parts (Voldtofte, 2005, p. 1). He explains that, “Magic in the middle is an emerging or arising phenomenon” and that “The word ‘magic’ indicates that we are not necessarily able to explain how the emergent emerges, but that we can ascertain that it happens” (Voldtofte, 2005, p. 1). Figure 2. Model illustrating the nature and components of Metaphor Magic in coaching and coaching supervision. “…a system is an organized structure of mass and energy existing in a dimension of time and space. More than a collection of parts, once organized, the system has properties that are not present when the parts are separate” (Mental Health and Illness, 2017). In this framework, the client’s system can be more easily seen and understood (i.e., from a 10,000-footview). The relationships among the array of objects chosen by the client form a “constellation” which serves as a relatively efficient and effective window through which the forces that affect the client’s work and social worlds are revealed. Thus, systemic constellations represented in the form of the client’s 3-D metaphoric landscape of objects make the client’s inner map more accessible. They allow clients to see and experience their questions/topics/scenarios and themselves in relation to them with greater clarity and potential answers or solutions may be revealed (Human Systems Institute, 2017). As Marcel Proust once wrote, “The real voyage of discovery consists, not in seeking new landscapes, but in having new eyes” [Proust, 1871-1922). Some clients like to take photos of what they have created to capture their metaphoric landscapes. The coach can invite this at one or more timepoints during the process, so that clients can revisit their landscapes and continue the process outside of the session. Metaphor mapping with objects offers clients more control over the processes of exploration and discovery as well as their experiences by giving their question or topic form in external metaphorical space (Mote, 2004; Lawley, 2010). This is the proverbial “Subject to Object” move (Kegan, 1994) where the client goes from not being able to see something because it is Subject or part of the self, and sometimes being stuck in relation to the question or topic because of this, to the role of witnessing and being able to see, know, organize, reflect on, assimilate, and otherwise operate upon the question or topic (Kegan, 1994). The Subject to Object move is a move to a more detached way of viewing and reflecting on a complex situation and its parts, and it provides clients with opportunities to access and engage the capacities of the neocortex. It allows for decontextualization of representations from the circumstances in which they were created (Zelazo and Lourenco, 2003). Thus, clients are well-positioned to find more organic and dynamic solutions and/or to see their questions/topics/scenarios with “new eyes” and experience them in new ways. “…in order to observe an object completely, we must look at it from all sides, …the same is true with life. … The situation has remained the same, but our perspective of it has changed. As we develop greater awareness, we can shift quickly between many perspectives and see the whole picture at once. The opportunity within the Principle of Correspondence is to develop our awareness so that we can see the many possibilities.” (Seale, 2016b p. 108). “…a passing thought will receive little energy, but if the thought develops and we give it attention, it begins to carry power. The more attention we give it, the more it begins to affect or shape our world and our relationship to it”. (Seale, 2016b, p. 114). And finally, The Principle of Vibration states that, “everything in the universe is made up of energy in vibration” (Seale, 2016b, p. 113). So, if we accept these principles, then creating and changing metaphors – meaning-making with the objects and their spatial relationships – is a form of shifting energy, and the Metaphor Magic process happens in an energetic field of which the coach needs to be aware. The coach and the client also bring energy to the process, and energy exists among the client, the coach, the question, the process, the objects and the wider system. And, answers to the question or solutions to the problem will emerge if the facilitator/coach “flows with” rather than “pushing” the client or the process. As a result, the process and the outcomes will unfold more organically for the client. “…the body is the domain of learning. When we learn through the body, we go beyond our intellectual understanding or cognitive awareness, to being able to take new action with ease, repeatedly, even when under pressure. We also hold our dignity in our body.” (Aquilina, 2016, p. 23). There is an emerging belief that the body knows first in terms of felt sensations and ways of knowing (Coates,2013; Gonzalez, 2017), and that we then impose our social construct of language (Dor, 2015) onto what is being felt, seen, or heard. Another important part of the Metaphor Magic process is the client’s somatic involvement in the process by selecting, physically manipulating and feeling the objects. These actions along with standing and viewing the metaphoric landscape from different vantage points help create kinesthetic-neural connections that go beyond how the client is feeling emotionally about the situation (Dede Osborne, personal communication, September 15, 2017). The coach can further invite clients to utilize their whole-body intelligence in the Metaphor Magic process by inviting them to check in with their head, heart, and gut on one or more occasions throughout the process (Blake, Strozzi-Heckler, and Haines, 2016). Research shows that the body is a larger processor than the brain and this process invites a whole-body approach to learning and discovery. To the degree that clients are able to embody their results, the process will be more powerful. By being aware of the energetic and somatic facets of the Metaphor Magic process, the coach is able to facilitate deeper learning for their client by helping them access their internal metaphoric landscapes. Functional magnetic resonance imaging (fMRI) has been used in a number of studies on the neural correlates of metaphor production and metaphor processing or comprehension (Rapp et al, 2004; Rapp et al. 2012; and Yang, 2014). Novel metaphor production engages both default neural networks and executive control networks (Beaty et al., 2017) and bilateral networks, or brain regions in both right and left hemispheres (Beaty et al., 2017; Benedek et al., 2014) as does metaphor processing (Bambini et al. 2011; Bohm et al., 2012; Schmidt and Seger, 2009). A meta-analysis by Rapp et al. (2012) of 28 non-literal language studies (including metaphor, idiom, and irony studies) indicated that a predominantly left lateralized network (i.e., ~68% of the activation foci were in the left hemisphere) is important in non-literal expression. However, novel metaphor processing appears to evoke more right hemispheric activity (Mashal et al., 2007; Yang, 2014), and significantly stronger activity than conventional metaphors (Mashal et al., 2007). In addition to novel/conventional metaphor distinctions, whether metaphors are familiar or unfamiliar and easy or difficult to understand also influence neural recruitment during metaphor processing (Schmidt and Seger, 2009). 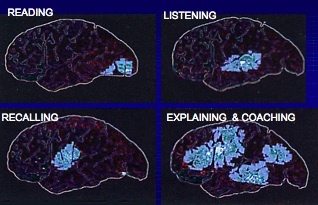 In addition to current understanding of the brain’s structures and functions (Boundless, 2017; Figure 3, Abhang et al., 2016), the findings from this growing body of empirical research on brain activation during metaphor production and processing suggest that clients’ engagement with abstract concepts through the Metaphor Magic process activates multiple regions of the brain (Eastman, 2012), including structures in both hemispheres of the cerebral cortex, as well as structures inferior to (lying below) the cortex and deeper aspects of the brain. Abhang et al. 2016, p. 4. Reproduced with permission from Elsevier (License number 4283370936723. License date: 6th February 2018). There is a wide variety of cognitive processes involved in symbolic modeling and metaphor mapping inherent in Metaphor Magic, including the choice of a question/topic/scenario and the selection, manipulation, and movement of objects that represent the client and different aspects of the question/topic/scenario the client chooses; working with language that mediates sensory and motor experience; vision; memory; emotion; awareness of physical/internal sensations; perceptions; planning, inquiry, creativity, and reflection, and new meaning-making. Therefore, Metaphor Magic could be said to utilize and foster what Alan Seale describes as “whole-mind thinking and whole-being awareness” (Seale, 2016b). We are intentionally engaging a whole range of cognitive functions, and to incorporate mental synthesis: the conscious, purposeful activation and synchronization of different neuronal ensembles (Wikipedia, 2017), and “one of the most interesting components of imagination, since it is responsible for so many of the uniquely human traits, such as mental planning, modeling and engineering. Humans are able to purposefully and deliberately create and inspect a seemingly endless array of novel images in the mind’s eye, but the neurological process underlying this essential human skill is not well understood.” (Vyshedskiy and Dunn, 2015). However, the idea underlying mental synthesis is more than half a century old and is the fundamental principle of neural change. Siegrid Löwel summarized Donald Hebb’s theory (Hebb, 1949) as: “neurons wire together if they fire together” (Löwel and Singer, 1992). As information is sent along neuronal pathways, those pathways can be reinforced with more “traffic” or “use” or weakened with the opposite (“disuse”). New connections can be created between neurons; new synapses can be formed. This capacity for change in the nervous system is known as neuroplasticity, first described by Polish neuroscientist Jerzy Konorski in 1948 (Simpkins and Simpkins, 2012). Neuroplasticity has been observed from the microscopic or neuronal level, to changes in synaptic activity, to cortical “remapping” (as in response to injury). Novel situations, problems, and challenges facilitate neuroplasticity because we don’t necessarily have pre-existing mental maps or models and, thus, we create them. Although this has not been tested via empirical research, we hypothesize that the Metaphor Magic process has the capacity to facilitate neuroplasticity, in that it includes factors known to facilitate learning such as attention, engagement, activity, and a supportive environment and relationship (Blake, 2017) in which clients are free to explore, discover/make meaning from and with metaphors, and create new patterns. We are all electricians in that we have the capacity to change or “sculpt” the structure and function of our brains by what we experience and practice, particularly with regard to how we direct our attention. As clients see and experience, reflect on, make sense of, and explain the meanings of their metaphoric landscapes in a Metaphor Magic Box coaching session, either verbally or through journaling, they activate multiple parts of their brains, (Figure 4, Susan Close Learning, 2010). In doing so, clients may be creating new neural pathways as they see and experience their question/topic/scenario and system in new ways. Neuroplasticity is possible for not only our clients, but also for us as coaches as we facilitate the Metaphor Magic process and witness the new meaning-making and connections our clients make. Artist’s rendition, from PET brain scan. (Citywide Media Vancouver © Susan Close Learning 2009. Reproduced by permission from Debbie Magnuson, artist, and Susan Close, Susan Close Learning). Metaphor Magic has several strengths that make it an attractive tool for use in facilitating awareness and change and in coaching and coaching supervision. It has a variety of applications in terms of audiences, it can be used in face-to-face or virtual environments with individuals and groups, and it supports good coaching and coaching supervision. Since the development of Metaphor Magic, the tool and process have been used in coaching individual clients, small groups, and teams; and with a variety of audiences, including educators, administrators, coaches, and corporate executives. The applications are as unique as the clients and coaching supervisees themselves. In a number of instances, the results have been life changing. Examples include coaches identifying their unique offerings and determining how they want to build their businesses, to clients clarifying priorities, identifying obstacles, determining how to approach healing a broken relationship, and making major life changes (e.g., reducing stress, changing careers, etc.). The symbolic modelling (Tompkins and Lawley, 1997) that helps undergird Metaphor Magic has also been utilized in educational and training environments for both students (e.g., to identify productive and unproductive learning strategies) and teachers (e.g., to better understand students’ attitudes, to have fun, to facilitate learning) (Tompkins and Lawley, 1997). Metaphor Magic has been used recently with school counselors and administrators, as well as in executive coaching. Its application can be expanded as an appreciation of its power becomes recognized. Symbolic modelling using the Metaphor Magic Box can be facilitated face to face or virtually. In face to face sessions, the facilitator/coach is able to sense shifts in energy and somatic nuances. With today’s reliable virtual platforms, we can also achieve a similar level of sensing of shifts, particularly if you can see both the body and facial language of our clients, as well as the movement of the objects on the mat. This can be facilitated by using two computers (or a combination of computer, laptop, tablet or smartphone) simultaneously. In addition to broad applications and powerful impact, another strength of Metaphor Magic is that it supports many of the core competencies of coaching and supervision as defined by various stakeholders and associations, such as the International Coach Federation (ICF), European Mentoring & Coaching Council (EMCC), Association for Coaching (AC), and others. These competencies include contracting; maintaining coaching presence; powerful questioning, listening, and reflection (providing observations where relevant); maintaining an awareness of the systems in which clients operate; facilitating perspective shifts; evoking greater understanding, awareness, clarity, and possibility; enabling insight and learning; and supporting clients in identifying and developing strategies to help them make their desired changes. In a coaching session using Metaphor Magic process, the coach holds their clients (or coaches as clients) as whole, creative and resourceful, and create and hold a safe space for their learning and discovery. Clients are supported in building their current realities and/or future realities, through visual metaphoric symbols, and in exploring potential gaps and identifying the actions needed to support change. In coaching supervision, we use the objects in the Metaphor Magic Box to create a picture of what is happening between coaches and their clients. Then we might explore the relationship using models such as the 7-eyed model of Coaching Supervision (Hawkins and Smith, p. 186-207)). As their metaphoric landscape is unpacked, client/supervisees become clearer on the issues confronting them, and they are supported in generating new ways of being with and/or taking action in regard to what is important to them. In this article, we introduced Metaphor Magic, its theoretical foundations, and described the tool (the Metaphor Magic Box), the content and context, and the process involved. Metaphor Magic is aligned with current knowledge related to somatics and neuroscience, in that it allows clients to create metaphoric landscapes using small objects, encourages them to access their whole-body intelligence, and fosters new perspectives on their landscapes and systems, likely creating new neural connections in the process. The process is very client-centered, and invites exploration, creativity, and generativity. Metaphor Magic has been used with a variety of audiences, in both face-to-face and online environments, and is an effective tool in coaching and coaching supervision. Clients have reported the impact of the Metaphor Magic process to be life-changing, and we have had similar experiences. Abhang, P.A., Gawali, B.W. and Mehrotra, S.C. (2016) ‘Chapter 1: Introduction to emotion, electroencephalography, and speech processing’, in Introduction to EEG- and speech-based emotion recognition. London: Elsevier Inc..Aquilina, E. (2016) Embodying authenticity: A somatic path to transforming self, team & organization. London: Live It Publishing.Bambini, B., Gentili, C., Emiliano Ricciardi, E., Bertinettoa, P.M. and Pietrini, P. (2011) ‘Decomposing metaphor processing at the cognitive and neural level through functional magnetic resonance imaging’, Brain Research Bulletin, 86, pp.203-216.Beaty, R.E., Silvia, P.J. and Benedek, M. (2017) ‘Brain networks underlying novel metaphor production’, Brain and Cognition, 111, pp.163-170. DOI: 10.1016/j.bandc.2016.12.004.Benedek, M., Beaty, R., Jauk, E., Koschutnig, K., Fink, A., Silvia, P.J. and Dunst, B. (2014) ‘Creating metaphors: The neural basis of figurative language production’, NeuroImage, 90, pp.99-106. Available at: http://www.sciencedirect.com/science/article/pii/S1053811913012664.von Bertalanffy, L. (1969) General system theory. New York, NY: Braziller.Blake, A. (2017) Body=Brain. Available at: http://embright.org/body-brain.Blake, A., Strozzi-Heckler, R. and Haines, S.K. (2016) Somatics, neuroscience, and leadership. Strozzi Institute. Available at: https://strozziinstitute.com/somatics-neuroscience-and-leadership-2/.Bohrn, I.C., Altmann, U. and Jacobs, A.M. (2012) ‘Looking at the brains behind figurative language—A quantitative meta-analysis of neuroimaging studies on metaphor, idiom, and irony processing’, Neuropsychologia, 50, pp.2669-2683. DOI: 10.1016/j.neuropsychologia.2012.07.021.Boundless (2017) The limbic system. Available at: https://www.boundless.com/psychology/textbooks/boundless-psychology-textbook/biological-foundations-of-psychology-3/structure-and-function-of-the-brain-35/the-limbic-system-154-12689/.Bowes, A. and Katz, A. (2015) ‘Metaphor creates intimacy and temporarily enhances theory of mind’, Memory and Cognition, 43(6), pp.953-963. DOI: 10.3758/s13421-015-0508-4.Brown, B. (2015) Rising strong: The reckoning. The rumble. The revolution. New York, NY: Spiegel & Grau.Cameron, L. (2008) ‘Metaphor and talk’, in Gibbs, R. (eds.) The Cambridge Handbook of Metaphor and Thought. New York, NY: Cambridge University Press, pp.197-211.Coates, J. (2013) The hour between dog and wolf: How risk taking transforms us, body and mind. New York, NY: Penguin Books.Desai, R.H., Conant, L.L., Binder, J.R., Park, H. and Seidenberg, M.S. (2013) ‘A piece of the action: Modulation of sensory-motor regions by action idioms and metaphors’, NeuroImage, 83, pp.862-869. DOI: 10.1016/j.neuroimage.2013.07.044.Dor, D. (2015) The instruction of imagination: Language as a social communication technology . London: Oxford University Press. Foundations of human interaction.Dunn-Fierstein, P. (2017) Working the world of symbols. Sandplay Therapists of America. Available at: http://www.sandplay.org/about-sandplay/working-in-the-world-of-symbols/.Eastman, Q. (2012) ‘Metaphors activate sensory areas of brain’, eScienceCommons. Available at: http://esciencecommons.blogspot.com/2012/02/metaphors-activate-sensory-areas-of.html.Friedman, H. and Mitchell, R.R.Sandplay Therapists of America (2017) What is sandplay therapy. Available at: http://www.sandplay.org/about-sandplay/what-is-sandplay/.Glucksberg, S. (1989) ‘Metaphors in conversation: How are they understood? Why are they used?’, Metaphor and Symbolic Activity, 4(3), pp.125-144.Gonzalez, G. (2017) Leaders: The body knows first. Available at: https://www.eightelementswest.com/body-knows-first/.Grove, D.J. and Panzer, B.I. (1989) Resolving traumatic memories: Metaphors and symbols in psychotherapy. New York, NY: Irvington Publishers.Hawkins, P. and Smith, N. (2013) Coaching, mentoring and organizational Consultancy: Supervision, skills & development (2nd edn.). Berkshire, UK: Open University Press.Hebb, D.O. (1949) The organization of behavior. New York, NY: Wiley & Sons.Heylighen, F. and Joslyn, C. (1992) ‘What is systems theory?’, in Heylighen, F., Joslyn, C. and Turchin, V. (eds.) Prinicipia Cybernetica Web. Brussels: Principia Cybernetica. Available at: http://pespmc1.vub.ac.be/SYSTHEOR.html.Human Systems Institute (2017) What are constellations?. Available at: https://www.human-systems-institute.com/what-are-constellations.International Coach Federation (2017a) Core competencies. Available at: https://coachfederation.org/core-competencies/.International Coach Federation (2017b) Core competencies comparison table. Available at: https://www.coachfederation.org/files/IndCred/ICFCompetenciesLevelsTable.pdf.Kegan, R. (1994) In over our heads: The mental demands of modern life. Cambridge, MA: Harvard University Press.Kline, N. (2013) Time to think: Listening to ignite the human mind. London: Cassell Illustrated.Kornfield, J. (2009) The wise heart. New York, NY: Bantam Books.Lacey, S., Stilla, R. and Sathian, K. (2012) ‘Metaphorically feeling: Comprehending textural metaphors activates somatosensory cortex’, Brain & Language, 120, pp.416-421. DOI: 10.1016/j.bandl.2011.12.016.Lawley, J. and Tompkins, P. (2000) Metaphors in mind: Transformations through symbolic modeling. Bancyfelin, Carmarthen, UK: Crown House Publishing, Ltd.Lawley, J. and Tompkins, P. (2001) ‘Metaphors in mind: A case study’, Anchor Point, 15(5). Available at: http://www.cleanlanguage.co.uk.Lawley, J. and Tompkins, P. (2004) ‘Clean Language revisited: The evolution of a model’, Rapport. Available at: http://www.cleanlanguage.co.uk.Löwel, S. and Singer, W. (1992) ‘Selection of intrinsic horizontal connections in the visual cortex by correlated neuronal activity’, Science, 255, pp.209-212.Mashal, N., Faust, M., Hendler, T. and Jung-Beeman, M. (2007) ‘An fMRI investigation of the neural correlates underlying the processing of novel metaphoric expressions’, Brain and Language, 100(2), pp.115-126. DOI: 10.1016/j.bandl.2005.10.005.Mental Health and Illness (2017) Systems Theory – What Is It?. Available at: http://www.mentalhealthandillness.com/systemstheory.html.Merriam-Webster (2017) Metaphor. Available at: https://www.merriam-webster.com/dictionary/metaphor.MIT Biology (2017) Brain anatomy overview. Available at: https://biology.mit.edu/sites/default/files/Brain%20Anatomy%20OverviewRev.pdf.Mitchell, R.R. (2017) ‘Alchemy in sandplay therapy’, Journal of Sandplay Therapy, 26(1). Available at: http://www.sandplay.org/journal/abstracts/volume-26-number-1/rogers-mitchell-rie-alchemy-in-sandplay-therapy/.Mote, J. (2010) History of David Grove’s work: 1980-2004. Available at: http://www.cleanlanguage.co.uk/articles/articles/279/1/David-Grove-history-of-work-1980-2004/Page1.html.Ortony, A. (1975) ‘Why metaphors are necessary and not just nice’, Educational Theory, 25, pp.45-53.Proust, M. (1871-1922) La prisonnière, À la recherche du temps perdu.Rapp, A.M., Mutschler, D.E. and Erb, M. (2012) ‘Where in the brain is nonliteral language? A coordinate-based meta-analysis of functional magnetic resonance imaging studies’, NeuroImage, 63, pp.600-610. DOI: 10.1016/j.neuroimage.2012.06.022.Schmidt, G.L. and Seger, C.A. (2009) ‘Neural correlates of metaphor processing: The roles of figurativeness, familiarity and difficulty’, Brain and Cognition, 71, pp.375-386. DOI: 10.1016/j.bandc.2009.06.001.Seale, A. (2011) Create a world that works: Tools for personal & global transformation. Newburyport, MA: Weiser Books.Seale, A. (2016a) ‘Complicated, complex, or both? Finding our way through a turbulent world’, Transformational Leadership blog. Available at: http://transformationalpresence.org/alan-seale-blog/complicated-complex-or-both-finding-our-way-through-a-turbulent-world/.Seale, A. (2016b) ‘Whole-mind thinking & whole-being awareness: The power behind Transformational Presence’, Transformational Leadership blog. Available at: http://transformationalpresence.org/alan-seale-blog/whole-mind-thinking-and-whole-being-awareness-the-power-behind-transformational-presence/.Simpkins, C.A. and Simpkins, A.M. (2012) ‘Neuroplasticity and neurogenesis: Changing moment-by-moment’, in Simpkins, C.A. and Simpkins, A.M. (eds.) Neuroscience for clinicians: Evidence, models, and practice. New York, NY: SpringerLink, pp.165-174.Susan Close Learning (2010) Smart Learning: Brain activity illustration. Available at: http://www.smartlearning.ca/smart_learning_materials.shtml.Stanier, M.B. (2016) The coaching habit: Say less, ask more & change the way you lead forever. Toronto, Canada: Box of Crayons Press.The Brain Waves Center (2003) ‘Your brain and what it does’, in Gamon, D. and Bragdon, A.D. (eds.) Building mental muscle (2nd edn.). Allen D. Bragdon Publishers. Available at: http://www.brainwaves.com.Tompkins, P. and Lawley, J. (1997) ‘Symbolic modelling’, Rapport, 38(Winter). Available at: http://www.cleanlanguage.co.uk.Voldtofte, F. (2005) Introduction to magic in the middle. Available at: voldtofte@worldcafe.dk.Vyshedskiy, A. and Dunn, R. (2015) ‘Mental synthesis involves the synchronization of independent neuronal ensembles’, Research ideas & outcomes, 1. DOI: 10.3897/rio.1.e7642.r20343.Wikipedia (2017) Mental synthesis theory. Available at: https://en.wikipedia.org/wiki/Mental_synthesis.Yang, J. (2014) ‘The role of the right hemisphere in metaphor comprehension: A meta-analysis of functional magnetic resonance imaging studies’, Human Brain Mapping, 35, pp.107-122. DOI: 10.1002/hbm.22160.Zelazo, P.D. (2015) ‘Executive function: Reflection, iterative reprocessing, complexity, and the developing brain’, Developmental Review, 38, pp.55-68. DOI: 10.1016/j.dr.2015.07.001.Zelazo, P.D. and Lourenco, S.F. (2003) ‘Imitation and the dialectic of representation’, Developmental Review, 23(1), pp.55-78. DOI: 10.1016/S0273-2297(03)00005-4. Lily Seto, MA Experienced leadership coach, coaching supervisor and facilitator who is a student of energy work, somatic work, and exploring metaphors. Christina A. Geithner: PhD in Kinesiology, academic, researcher, coach, and mentor coach; designer and facilitator of experiential workshops fostering mindfulness, leadership, and embodiment.